Has Mnangagwa Threatened to Arrest Opposition Leader Chamisa? Zimbabwean President Emmerson Mnangagwa has acknowledged the disastrous results of his predecessor's "land reform" in a bid to win over white voters. Elections in the southern African country are slated for July 30. Zimbabwean President Emmerson Mnangagwa told a crowd of white voters Saturday that their land wouldn't be taken away and called on them to work with the government, during a campaign rally nine days before elections. Mnangagwa's appeal to white voters, many of them farmers, marked a sharp departure from his predecessor Robert Mugabe, who launched an often violent "land reform" campaign to seize farmland from white owners and give it to blacks. The policy devastated the agricultural sector, sparked a man-made famine and triggered an economic collapse. Mnangagwa, a former ally of the 94-year-old Mugabe, became president last November after Mugabe was ousted in a de-facto coup. Mnangagwa, 75, also leads the Zimbabwe African National Union-Patriotic Front (ZANU-PF). Mugabe co-founded the party 30 years ago and presided over it and the country for nearly 40 years, until he was ousted late last year. Mnangagwa, who has been the target of at least one assassination attempt, is believed to be in a tight race against his main political rival, Nelson Chamisa, 40, of the Movement for Democratic Change (MDC). The president is trying to win over white voters who often vote for the MDC or other opposition parties due to the devastating policies unleashed by Mugabe. At the rally in Borrowdale, an upscale suburb of the capital, Harare, Mnangagwa conceded that much of the land stolen from white farmers had been given to powerful politicians, soldiers or tribal leaders who knew little or nothing about farming. "I know of some chiefs who have moved from one farm to another," Mnangagwa told the crowd. "Then they run it down. Then he leaves that farm and he is issued another one. He runs it down. That time is gone." 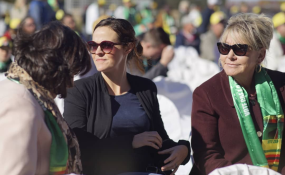 The crowd of white Zimbabweans welcomed the olive branch being extended by Mnangagwa, seeing it as a significant turning point in race relations. "He's recognizing everyone as the same. We're all one now, which is beautiful," said Cais Carstens, a mining engineer. "This has never happened before, so it's good." However, political opponents dismissed Mnangagwa's overture as little more than a publicity stunt aimed at pleasing powerful political and financial interests.